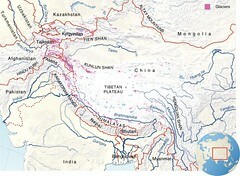 The Himalayas–Hindu Kush, Kunlun Shan, Pamir and Tien Shan mountain ranges function as water towers, providing water to people through much of Asia. The glacier-fed rivers originating from the Himalaya mountain ranges surrounding the Tibetan Plateau comprise the largest river run-off from any single location in the world. 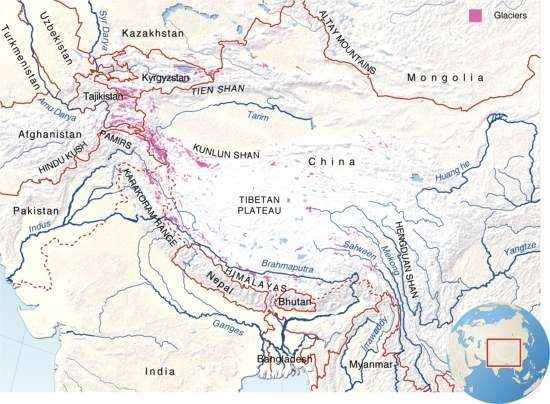 While the mountains are homes to some 170 million people, the rivers that drain these mountains influence the lives of about 40 per cent of the world’s population. The rivers provide household water, food, fisheries, power, jobs and are at the heart of cultural traditions. The rivers shape the landscape and ecosystems and are important in terms of biodiversity. The water towers of Asia While mountains traditionally have been considered the major water sources of the region, there is great diversity in the hydrological significance of mountains and glaciers for downstream water supply, particularly between the dry north-western region and the monsoon-influenced south-eastern regions. In spite of the vast water supply, seasonal water scarcity is a major issue.